The 2012 shareholder meeting cycle, in which publicly traded U.S. companies convene to consider corporate business, is reaching an end. One hundred fifty of the 200 largest American companies (by revenues) as ranked by Fortune magazine have held their annual meetings as of May 29, and most of the remainder will do so by the end of June. 2012’s annual meetings have been notable for various shareholder protests, organized by labor unions and their allies in the “Occupy” movement, at various large companies, particularly in the financial sector. 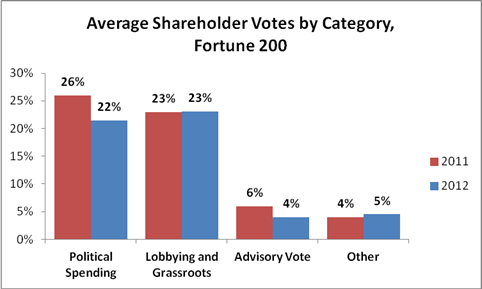 This year, as discussed in earlier findings and reports, activists who attempt to influence corporate management through the shareholder voting process have focused their efforts on proposals to increase disclosure of or to limit companies’ political spending and other political activities, as well as proposals to separate companies’ chief executive and chairman positions. Activists have also targeted certain companies’ executive compensation packages, now subject to advisory shareholder votes at all public companies under the Dodd-Frank Wall Street Reform and Consumer Protection Act of 2010. A review of shareholder advisory votes on executive compensation. The report finds that, in general, activists’ increased energy has not translated into greater support among voting shareholders. As of May 21, 160 of the Fortune 200 companies had filed annual-meeting proxy materials. The number of proposals per company is slightly higher than in 2011—1.5 per company versus 1.4 last year—though still slightly below preceding years. This decline is mostly attributable to a drop in proposals related to executive compensation, which have fallen in the last two years because previously common proposals calling for shareholder advisory votes on compensation are no longer necessary, now being mandatory under Dodd-Frank. 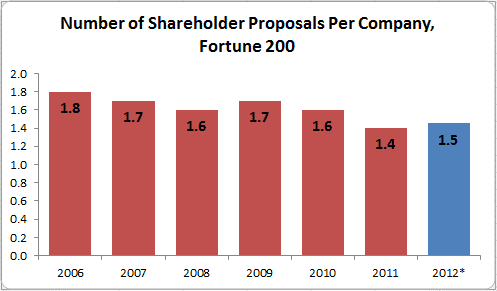 While the number of shareholder proposals has remained fairly constant, the composition of proposals has shifted. 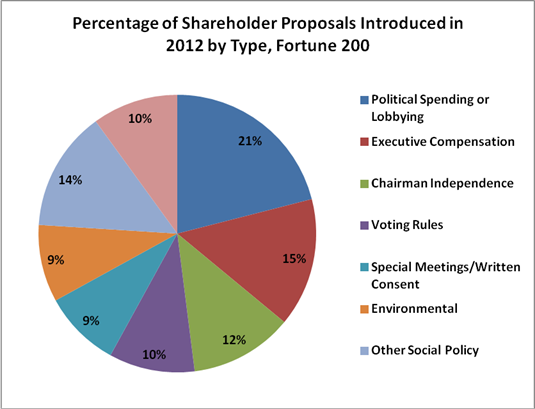 In previous years, in addition to executive compensation, a plurality of shareholder proposals related to environmental concerns. Although a significant number of environment-related proposals have been introduced in 2012—9 percent of proposals overall—there have been fewer such proposals this year. 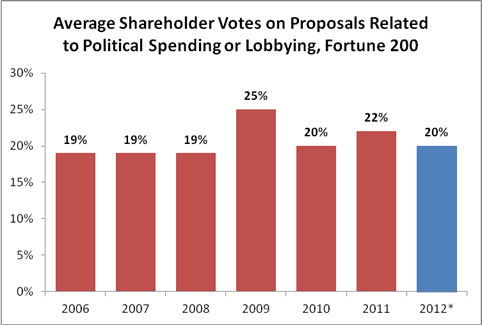 The most frequently introduced proposals in 2012 have involved political spending or lobbying, executive compensation, chairman independence, and shareholder voting rules. A plurality of all proposals, 21 percent, have involved a company’s political spending or participation in the electoral or legislative process. The prevalence of shareholder proposals related to political spending continues a recent upward trend since the Supreme Court’s 2010 Citizens United decision, which held that corporate political speech was protected by the First Amendment. From 2006 through 2009, Fortune 200 companies averaged between a 9 and 11 percent likelihood of facing a proposal related to political participation. In 2010, that likelihood rose to 14 percent, rising to 20 percent in 2011 and 30 percent this year. Apart from Citizens United, the increasing volume of proposals concerning corporate political participation is likely due to efforts by certain members of the academy and the Center for Political Accountability (CPA), as well as the 2012 presidential campaign cycle. Critics of the CPA, such as Brad Smith, a former commissioner on the Federal Elections Commission, argue that simple disclosure is not the group’s end goal and that the groups’ efforts would harm rather than advance shareholders’ interests. Smith observes that one of the proponents of the CPA proposal, the social-investing fund NorthStar Asset Management, “urges its clients to divest themselves from targeted companies, retaining just enough shares to engage in corporate activism”—thus belying the claim that the group’s efforts are intended to improve share value. And Smith notes that the president of the CPA, former Democratic Congressional staffer Bruce Freed, co-signed a letter written to companies by another CPA proponent, the social-investing fund Walden Asset Management; that letter urged companies to pull support from certain trade associations that took public positions on environmental issues with which the signatories disagreed—thus belying the CPA’s claim to be interested solely in disclosure. Whatever the motives of the sponsors of political-spending-related proposals, they do not seem to be catching on with shareholders in 2012. Although the number of shareholder proposals related to political spending or lobbying has trended sharply upward, these proposals have not gained significant traction. 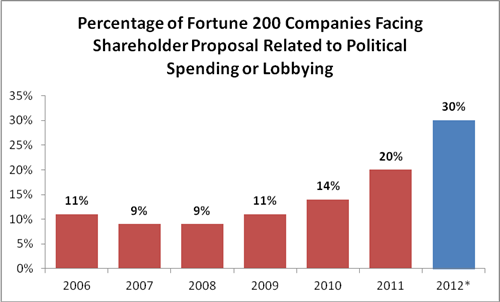 On average, proposals related to political spending or lobbying have garnered the support of about 20 percent of shareholders since 2006, and the overall support for these proposals has actually fallen from 21.9 percent to 19.8 percent from 2011 to 2012. No proposal related to political spending or participation has garnered 40 percent support at a Fortune 200 company in 2012. Nine of 34 proposals voted on to date in 2012 have garnered at least 30 percent support, as compared to twelve of 37 in all of 2011. When adjusting for type of proposal, the year-over-year shareholder votes have been, on average, relatively constant. Proposals calling for disclosure of political spending, including most prominently that developed by the CPA, garnered 26.1 percent of the vote in 2011 and 21.5 percent, to date, in 2012. Those related to grassroots expenditures and lobbying rose slightly in support, from 22.7 percent to 23.1 percent. Other proposals—including those calling for a shareholder advisory vote on political spending and a direct prohibition on corporate political spending—have garnered low single-digit support. Notwithstanding the overall consistency of limited support for political spending-related proposals, there has been significant company-to-company variation, year over year. Support for the CPA proposal fell among shareholders at Sprint Nextel (from 41 percent to 19 percent) and those at JP Morgan Chase (from 30 percent to 9 percent), while the same proposal garnered more support among shareholders at AT&T (rising from 31 percent to 39 percent) and Boeing (rising from 19 percent to 26 percent). Such variation across companies suggests that activist focus and corporate response are significant to shareholder vote results. As discussed in the Proxy Monitor 2012 winter report, labor unions and the leaders of public pension funds announced an intention to push for proposals seeking to separate the CEO and chairman positions in 2012. To date, such chairman-independence proposals have constituted 12 percent of all proposals—this class of proposal is the third most frequently introduced this year, behind those related to corporate political participation and executive compensation. As of May 21, 29 of the Fortune 200 companies faced a chairman independence proposal on the proxy ballot—more than in any year dating back to 2006, even though only 160 of the Fortune 200 companies had yet filed proxy materials with the Securities and Exchange Commission. 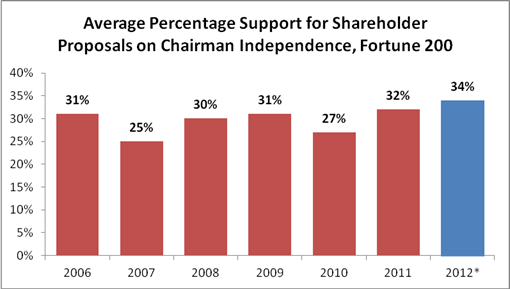 As with proposals related to political spending, activists’ enthusiasm for chairman independence has not translated into broad shareholder support. 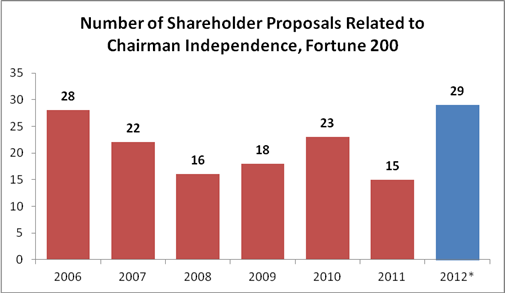 On average, chairman independence proposals have garnered 34 percent of shareholders’ votes in 2012, up only slightly from 2011 and other recent years. Similarly, notwithstanding the well-publicized shareholder rejection of the executive compensation package proposed by Citi, large-company shareholders in 2012 have continued to back most executive pay packages. In fact, the average shareholder advisory vote for executive compensation has risen slightly year over year, from 87.5 percent in 2011 to 87.9 percent in 2012. In 2011, the shareholders at three companies (Hewlett-Packard, Freeport McMoran, and Constellation Energy) rejected proposed compensation packages, as compared to two companies to date in 2012 (Citi and Community Health Systems). As discussed in earlier findings, for 2012, the proxy advisory firm Institutional Shareholder Services (ISS) adopted a policy of challenging management to respond whenever fewer than 70 percent of shareholders have voted for management’s proposed executive compensation plan in the prior year. To date, 14 companies have failed to meet the 70 percent threshold this year, as compared to 21 in 2011. It will be interesting to watch these companies in particular heading into 2013. In all three areas of focus for shareholder activists in 2012—political-spending proposals, chairman-independence proposals, and shareholder advisory votes on executive compensation—increased energy on activists’ part has led to limited or no increase in actual shareholder support. In contrast to recent activist efforts that were successful, such as ending staggered elections for directors and requiring support from a majority of shareholders to elect directors, shareholder activists’ current proxy-season agenda is getting little traction among the broader class of equity owners. This report analyzes information gathered from the Manhattan Institute’s ProxyMonitor.org database, which contains information relating to all shareholder proposals submitted for shareholder vote since 2006, for the 200 largest American public companies. See, e.g., Suzanne McGee, Shareholder Spring? Protesters Roil Annual Meetings, Fiscal Times, May 10, 2012, available at http://money.msn.com/top-stocks/post.aspx?post=c63bfa9d-bc77-4479-8958-c2eccca6c849 (describing protests by “The 99% Movement,” an offshoot of the Occupy Wall Street Movement, at annual meetings for companies including Bank of America, Citigroup, General Electric, and Wells Fargo); Patricia Sabatini, Protesters, Shareholders Vent Grievances at BNY Mellon Annual Meeting, Pittsburgh Post-Gazette, Apr. 11, 2012, http://www.post-gazette.com/stories/business/news/protesters-shareholders-vent-grievances-at-bny-mellon-annual-meeting-630794/; David Henry & Ross Kerber, Citigroup Loses Advisory Vote on Executive Compensation, Chi. Trib., Apr. 17, 2012, http://articles.chicagotribune.com/2012-04-17/business/sns-rt-us-citi-votebre83g15u-20120417_1_citigroup-chief-executive-vikram-pandit-shareholders; Jessica Silver-Greenberg & Nelson D. Schwartz, Citigroup’s Chief Rebuffed on Pay by Shareholders, N.Y. Times, Apr. 17, 2012, http://dealbook.nytimes.com/2012/04/17/citigroup-shareholders-reject-executive-pay-plan/; Service Employees International Union, http://www.seiu.org/ (last visited Apr. 27, 2012). See, e.g., James R. Copland, Shareholder Activism: What to Watch for in the 2012 Proxy Season, Proxy Monitor, http://www.proxymonitor.org/Forms/pmr_03.aspx (last visited May 24, 2012); James R. Copland, 2012 Proxy Season: Early Report—Labor Funds Focused on Union-Organizing Campaign Targets; Nuns Mostly Absent in 2012 Proxy Season, Proxy Monitor, http://www.proxymonitor.org/Forms/2012Finding2.aspx (last visited May 24, 2012); James R. Copland, 2012 Proxy Season Under Way: Shareholder Advisory Firm ISS Serving as Corporate America’s Paymaster, Proxy Monitor, http://www.proxymonitor.org/Forms/2012Finding1.aspx (last visited May 24, 2012). See generally Reports and Findings, Proxy Monitor, http://proxymonitor.org/Forms/reports_findings.aspx (last visited May 24, 2012). See Pub. L. No. 111-203, 124 Stat. 1376, at §951 (2010); 17 C.F.R. § 229.402 (2011). See Citizens United v. Fed. Election Comm'n, 130 S. Ct. 876 (2010). See, e.g., Lucian A. Bebchuk & Robert J. Jackson, Jr., Corporate Political Speech: Who Decides?, 124 Harv. L. Rev. 83 (2010), available at http://www.harvardlawreview.org/issues/124/november10/Comment_7308.php. See Center for Political Accountability, http://www.politicalaccountability.net/ (last visited May 24, 2012). Center For Political Accountability, http://www.politicalaccountability.net/index.php?ht=d/sp/i/870/pid/870(last visited May 24, 2012). Larry E. Ribstein, The First Amendment and Corporate Governance (Illinois Pub. Law. Research Paper No. 10-24, 2011), available at http://truthonthemarket.com/2011/05/24/the-first-amendment-and-corporate-governance-2/, http://ssrn.com/abstract=1739264. See Copland, Shareholder Activism: What to Watch for in the 2012 Proxy Season, supra note 2. See Copland, 2012 Proxy Season Under Way: Shareholder Advisory Firm ISS Serving as Corporate America’s Paymaster, supra note 2.